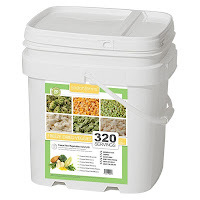 44% Off Lindon Farms Fruits & Veggies - Act Fast! a. Where to start? How about with the brand new MH Military Surplus 10-Year Pouches ... for feeding a small army or a good-sized family group. Shelf life is 10 years at least. These are member discounted and of course ship free. b. Next--the 7-Day Kits are temporarily available again! 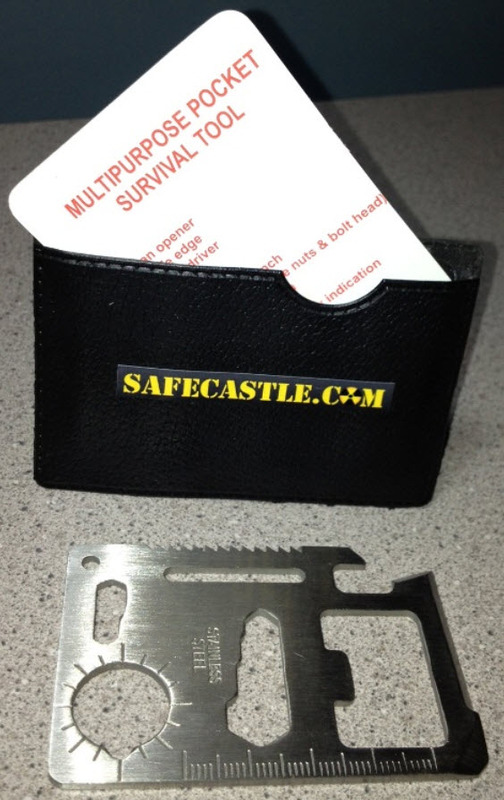 These have always been really popular with preppers, yet they are rarely produced and packaged by MH. It has been a few years since we have been able to offer them. Right now, MH has just a few hundred in stock, so move very fast if you want these--again, yes, member discounted. 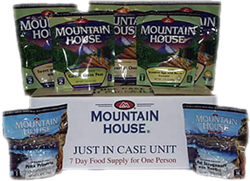 c. A brand new MH 10-Pack of favorite dinner pouches, double servings, 7-year shelf. Great for camping, go-bags, car trunks, etc. And yep--member discounted. d. Some great new low-sodium varieties in pouches and in cans (pouches are member discounted): Chicken Alfredo (pouches, cans); New Orleans Rice & Shrimp (cans, pouches) and Chicken & White Bean Chili (only in pouches). 2. MH-Can Price Hike takes effect August 1. Many of the canned varieties will be rising in price by 5%, as determined by the factory (and required by our dealer agreements). We had previously expected the price hike to take effect July 1, but delays at the factory give you an additional month to take advantage of the pre-hike pricing. 3. We have been "gifted" by MH with a fourth allowed can sale this year and we are running that additional sale from July 4-18. The discounts will be the maximum-allowed 25% for all MH can listings. Everything ships free and our buyers club members additionally enjoy our unique Royalty Rewards program for qualifying purchases. Remember--we always match other MH dealers' sale prices at any time so you can always get your best pricing plus your member rewards on top of that! 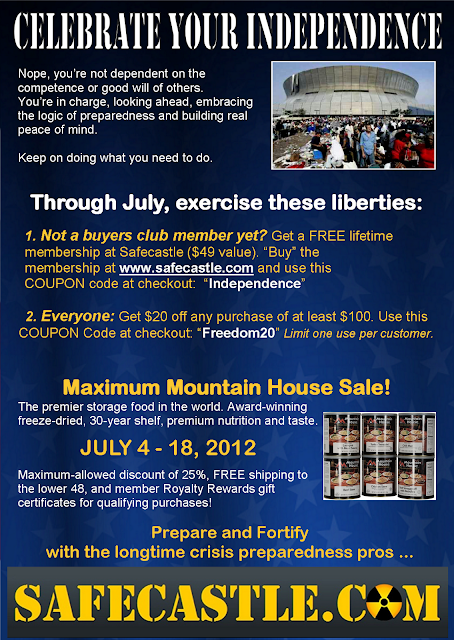 Use the Free Lifetime Buyers Club Membership coupon code below. Use the $20 coupon code below on anything in the store. Free Lifestraws and a Prepper Survey! To get in the daily Lifestraw drawing on Facebook, simply go to our Facebook page, find the current day's drawing thread, and post a link in that thread to a favorite Safecastle product listing. Then come back daily to find out if you are a winner and to re-enter the next day's drawing. b. 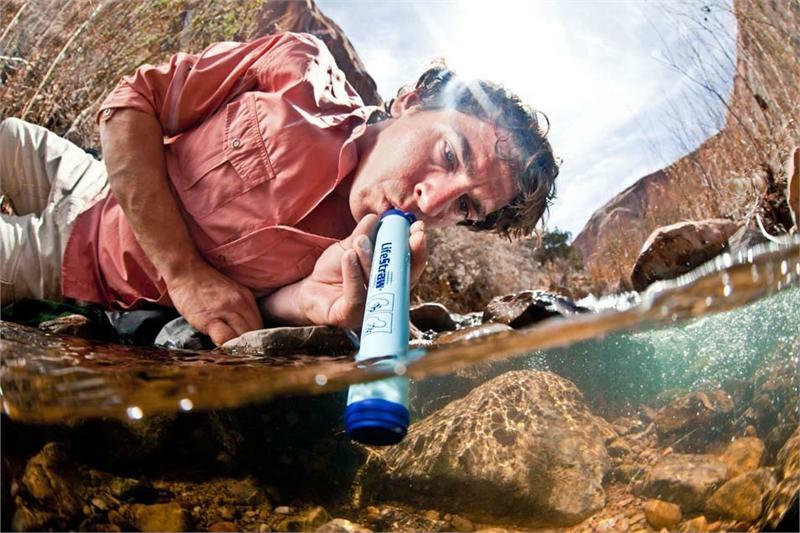 We are also posting a Lifestraw giveaway thread in our SurvivalistBoards forum every day for another way to get your hands on one. 2. 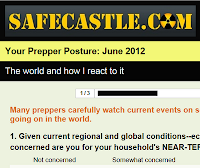 The first in our planned series of prepper polls is out and I want to encourage you to participate--"Your Prepper Posture - June 2012". It takes but a few minutes. You can also see results at any time here. Poll: "Your Prepper Posture - June 2012"
Please take our first in a series of SurveyMonkey prepper polls ... "Your Prepper Posture - June 2012"
Mountain House POUCHES Pass the Taste Test at 30 Years! 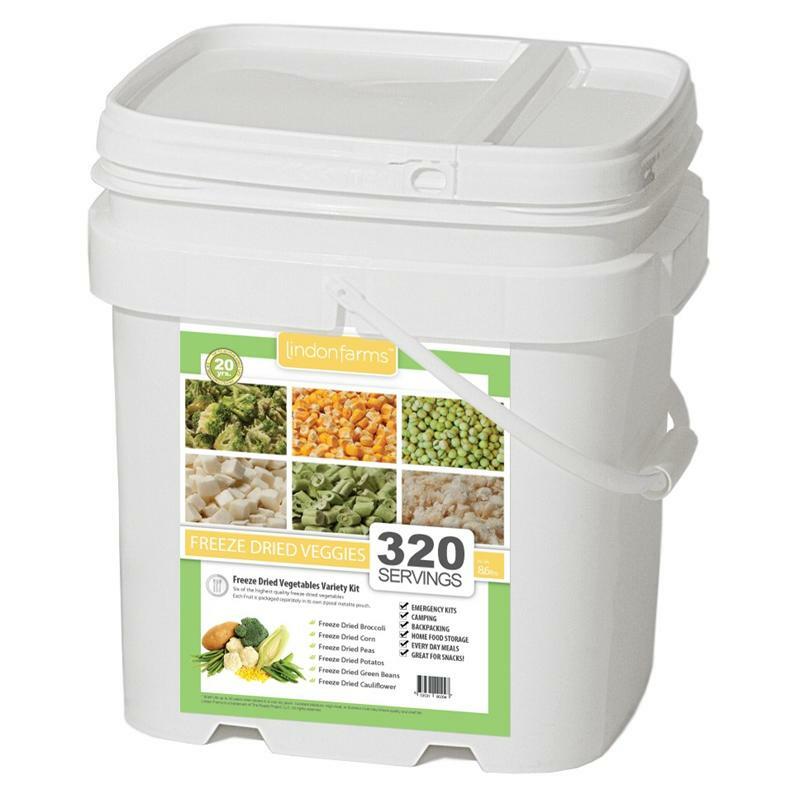 We all know Mountain House freeze dried food in cans is going to be good for 30 years. But now the good folks at MH just tested some of their stored POUCH foods from 30 years ago to give them the once-over. 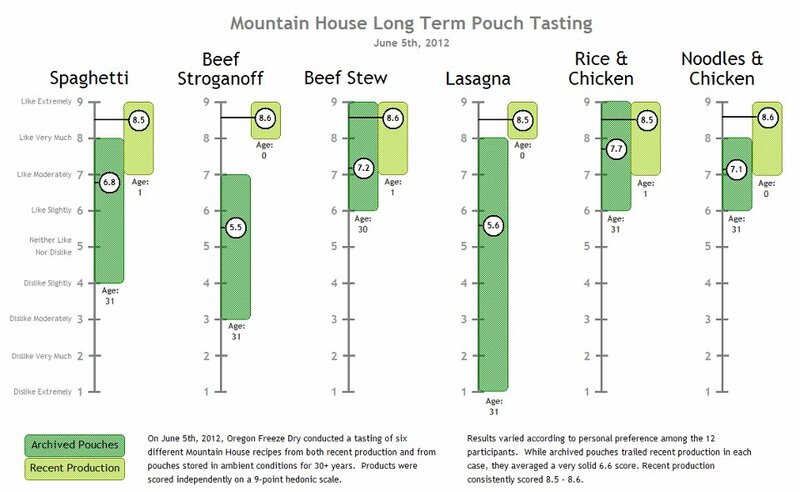 So we're often asked about the shelf life of Mountain House meals. Our pouches have a "Best if Used By:" date of 7 years after production. What happens after 8 years? 10 years? 20 years? Last week our team decided to take matters into our own hands and opened up the Mountain House Archive to test six different 30-year old pouches. And by "test", we mean "taste". Safecastle's experienced shelter builders (20 years and 500 shelters around the USA) provide some of the most robust, yet cost-effective shelters available. Storm shelters, safe rooms, NBC fallout shelters, and now also military-grade bomb/fallout shelters are made of heavy-gauge steel plate ... engineered to last almost 100 years, lifetime guaranteed for structural integrity. Shelters ranging in value from $5K to well over $1M have been built and installed for private households, corporations, communities, and government agencies. Have a look at some 3D modeling of a 50-foot Military-grade Fallout / Bomb Shelter. 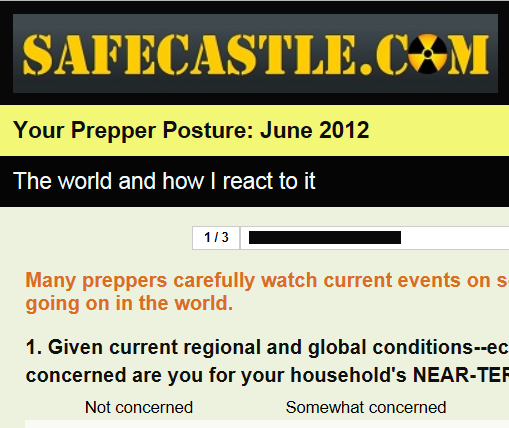 See also the Safecastle shelter site with much more info, images, price lists, and video--including clips of The Weather Channel doing their best to destroy one of those shelters - very amusing, entertaining, and impressive. Prepare Now ... "Devaluation Disregarded"
See also: "What's Your Plan A: Bug-out or Dig-in?" 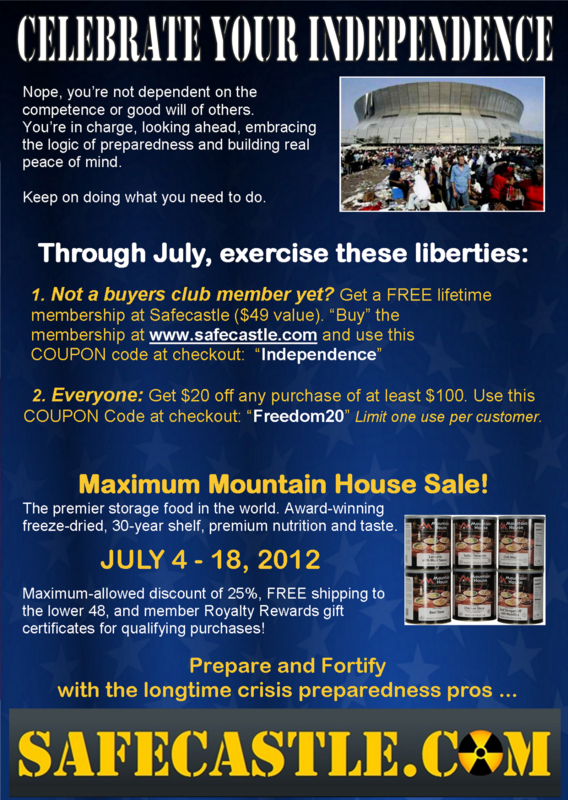 Shop online at www.safecastle.com and get club member discounts and free shipping all the time on the world's best storage food brands, such as Mountain House freeze dried food.